Just started a new Star Wars customizing blog with my 6 year old and wanted to share the blog with a forum full of Star Wars customizing fans. Our new blog will showcase the customs we've made so far and some customs made by other artists that we picked up along the way. We'll try and provide you with some links to these talented artists in case you want to get some of their customs for your own and I will give you some tips on customizing for those of you who are just starting out. I only just started customizing so don't expect much, but I hope our presentation makes up for the lack of experience. Hope to see you there. Follow us if you like what you see and spread the word. Last edited by DarthDaddy on Mon Apr 15, 2019 4:39 am, edited 178 times in total. Nice site, and it's awesome to have a hobby like that to share with your little one. ^ Pretty nifty too, btw. Thanks so much for the encouragement. Just reading all the topics in the forums provided us with so many great ideas. Hope we can be around for you all for the duration. Thanks for welcoming us to the community. Latest custom on the blog! Another custom posted at the blog this week! Last edited by DarthDaddy on Mon Sep 27, 2010 4:36 pm, edited 1 time in total. Last edited by DarthDaddy on Mon Sep 27, 2010 4:36 pm, edited 3 times in total. Ha Ha, Frogoctopus is one of the funniest custom things I've seen on the boards in a while. Man that's funny. That rocket firing battle droid is also nice, and I really like the Chiss. Great work on all of these. Frogoctopus was a creation of my 6 year old. If you think the picture is funny, you should hear the voice he uses when he plays with her. It's hilarious! 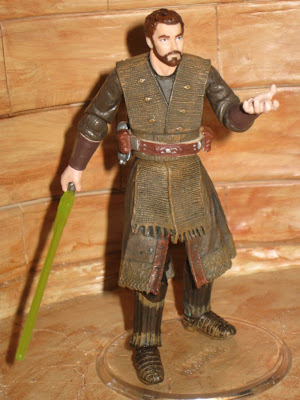 The Chagrian Jedi was made by a customizer by the name of JACKOFTRADZE. There is a link to his blog and his ebay auctions on our blog. Yeah, I know Jackoftradze and chat with him from time to time about customizing, among other things. He really pumps out a ton of good ones. He definitely does. We acquired some more Jackoftradze customs since the last post we did on him, so we may have to do another Customizer Spotlight on him down the road to show the new customs we got since then. Keep an eye out. I'll post on here when it happens. I have a lot of posts coming down the road. I made a bunch of new customs that I haven't displayed yet and I have several other great artists and customs in our collection I need to get to first, but I'm eager to get some of his new stuff up on display. OBI WAN - "CRAZY HERMIT"
Last edited by DarthDaddy on Wed Apr 13, 2011 3:56 pm, edited 2 times in total. Great customs and a very cool site. I am waiting to see that R2 droid with arms holding the blaster! Hey thank you both for the positive feedback on our site. Especially about the "CRAZY HERMIT". I wasn't sure about him initially, but I'm feeling better about him now. "R2-Bertie" or "Goliath" as we like to call him here at home will be posted as soon as I get the go from PACK RAT STUDIOS. I don't like to do a post on artist's work until I get the go from them. Even if it's from our personal collection. I hope I get the approval soon though because I'm eager to get that action figure posted. It's my favorite droid hands down. I'm going to attempt to contact PACK RAT STUDIOS again before I go to bed and see what I can do.